The Springboks, South Africa's renowned rugby team, are no strangers to making history. The country played host to the 1995 Rugby World Cup – the first since the end of apartheid – and the Springboks’ victory in the tournament helped to mark the emergence of the Rainbow Nation. The Rugby World Cup 2015 will continue to shine the limelight on the green shirt. Playing on the theme of inspiration, team sponsors Absa Bank have created the MyGreatestGame campaign (confusingly, the hashtag is #GreatestGame), celebrating people who’ve inspired, motivated and done good; winners bag a Springboks experience at a charity of their choice. Like many of the teams in this year's clash of the international rugby titans, the Springboks have a hashtag to help promote the team – #HomeGroundAdvantage. It doesn't refer to South Africa somehow playing at home, but rather plays on the fact that wherever the team is playing, that's home: "We’re not just sending a team to the UK. This time we’re all going." As you'd expect, the associated launch video is dramatic, emotive and movie-like – racking up more than 50,000 views in three days. It was even retweeted by former Rugby World Cup winning UK coach Clive Woodward. Also getting on board with the #HomeGroundAdvantage hashtag is team sponsor Castle Lager, with a rather more upbeat ad that makes use of the phrase. 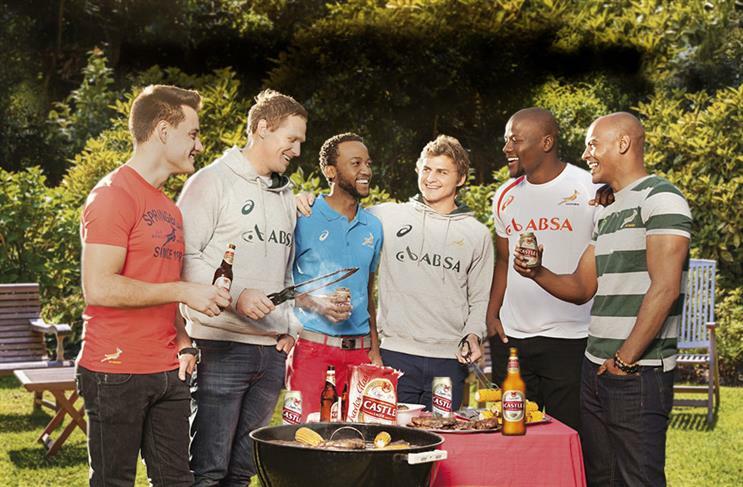 Castle Lager has – unsurprisingly – also been playing up the social aspects of the game, enlisting Bakkies Botha to man the barbecue at a fan braai area – and offering fans the chance to win a "braai with the Boks". The biggest feature of the #HomeGroundAdvantage campaign, though, is the number on the back of the Springboks jersey – it’s made up of dozens of photos of people. Some are friends of the players, and inspirational figures; others have been given the opportunity to appear on the jersey thanks to a competition run by the various sponsors. Asics, the team's kit sponsor, opted to showcase its involvement with the team in a video of a jersey signing session – which naturally makes much of the shirt’s technical qualities and the opportunity for the team to give back to the fans. The shirt – "the most technically advanced jersey the Springboks have ever worn" – found itself the subject of some negative feedback, because of the placement of logos. The Springbok emblem has – not for the first time – been relegated to the right sleeve, while the official emblem of South African sports teams, the Protea, takes pride of place on the front of the jersey. Although the decision rubbed some people the wrong way, it was entirely out of Asics' hands, being mandated by World Rugby – but fan interest in such details is something that brands need to be aware of. BMW is on board as the team's official vehicle sponsor; as you'd expect there's an advert and, as appears to be the theme for this team, it's dramatic, positioning the brand as the "driving force" behind the Springboks. It's also eerily similar to the BMW Australia ad for the Wallabies – given the passion of sports fans, taking a "one-size-fits-all" approach to international team sponsorship might come back to bite the brand, if they become aware that the brand's support for the team is mirrored identically elsewhere. Also ferrying the Springboks around is South African Airways – which has limited its rugby-related promotional activities to a series of videos featuring the Springboks, and a celebratory "SPRINGBAK" flash sale to celebrate the team’s success. It is, if we're honest, not quite as professionally glossy as other brands' efforts.